You want a wedding with that burger? In October, Hong Kong became the first city in McDonald’s burger kingdom to announce that it will offer wedding packages to prospective partners. Ever since one pioneering couple that met and dated at a branch on the island said their vows there, the chain has been receiving phone calls from other soon-to-be-weds seeking fryerside nuptials. Packages include Happy Meal toy party favors and a wedding cake comprised of individually boxed apple pies. December 20, 2010 Posted by oldstersview | Strange	| Hong Kong, McDonalds | Comments Off on You want a wedding with that burger? Weary world travellers will soon be able to wash down their Big Mac with a strong beer following a court decision to grant fast-food chain McDonald’s an alcohol licence for its Stockholm Arlanda restaurant, reports Christian website Dagen. The McDonald’s restaurant at Stockholm Arlanda Airport finally secured approval for its application for an alcohol licence on Thursday when an appeals court (Kammarrätten) overturned previous rejections from both Sigtuna council and the county administrative court. 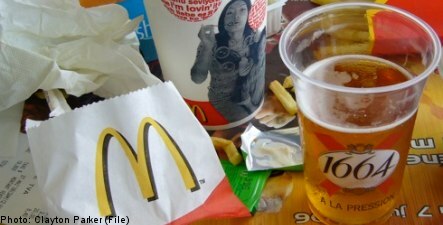 Both the council and the county court had ruled that as a family-orientated fast-food restaurant McDonald’s was not a suitable place for strong beer to be sold. March 17, 2009 Posted by oldstersview | Strange	| beer, McDonalds, Sweden | Comments Off on Mac and Brew, Please. I’ll hang upside down from your tree! That’ll show you! A woman seen hanging upside down from a tree in a McDonald’s parking lot before lying on her car’s hood following a confrontation inside the fast food eatery remained Tuesday in the St. Lucie County jail, according to an arrest affidavit and a jail official. Amity Joy Doss, 24, on Sunday afternoon told an assistant manager at the restaurant in the 4800 block of North Kings Highway to fire a cashier waiting on a customer in front of her. Thinking Doss, who hadn’t spoken to the cashier, was joking, the assistant manager ignored the comment, the affidavit stated. Officials reported Doss then proceeded behind the counter and pulled the juvenile cashier by her shirt and waist, saying the service was “not acceptable.” The manager told St. Lucie County sheriff’s investigators he told the cashier to go in the back until it was safe to return. April 10, 2008 Posted by oldstersview | People, Strange	| McDonalds, tree | Comments Off on I’ll hang upside down from your tree! That’ll show you!